Wood Pellet Boilers are excellent solutions for renewable heat sources. They’re highly efficient, can be fully automated, save space compared to alternative products, and burn a waste product as the energy source. Of course all renewable technologies need to have a realistic payback time in which to make your investment worthwhile, as well as reducing the carbon footprint of your home or business. Our friendly team of engineers will show how this is possible. Additionally they will discuss the UK government Renewable Heat Incentive (RHI) and let you know which boilers have the necessary accreditation. The RHI can pay most of the costs of installation. Wood Pellet Boiler Supplier Gone Out Of Business? At Wood Pellet Solutions it is our goal to guide people towards the most suitable wood pellet boiler for their needs. Wood pellet boilers can be located in a number of different areas/rooms of a property. They can also be used in combination with other heating such as Solar. They’re rated at different outputs e.g. 25 kW. Wood pellet boilers have been developed in a number of countries where, unlike the UK, there has not been the same cheap access to Gas, but they do have supplies of sustainable wood. Often this was coupled with cold temperatures during winter. Whilst wood gasification boilers have their advantages these countries developed more automated solutions where the fuel could be automatically fed. In addition there are central European countries such as Bulgaria where over a third of the country is covered in trees. Whilst these countries have been generally burning wood on open fires, they are now turned on to exporting pellets and developing robustly engineered solutions. Therefore the bulk of the pellet stoves and boilers that you will find on sale will come from Austria, Italy and Nordic areas. They have 3 distinct styles of solution according to the markets that have developed. Other solutions seem to be modeled on these. In Italy many of the houses have hot air ducting and due to the warm climate do not need heating for as much of the year as other countries. Their solutions started with stoves that were affordable and therefore had to be placed in living areas e.g. lounge or dining room. 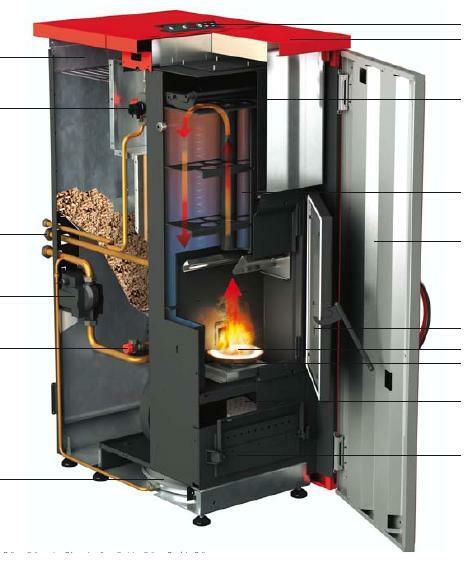 If you would like to know more about the advantages and disadvantages of wood pellet boilers, click here.